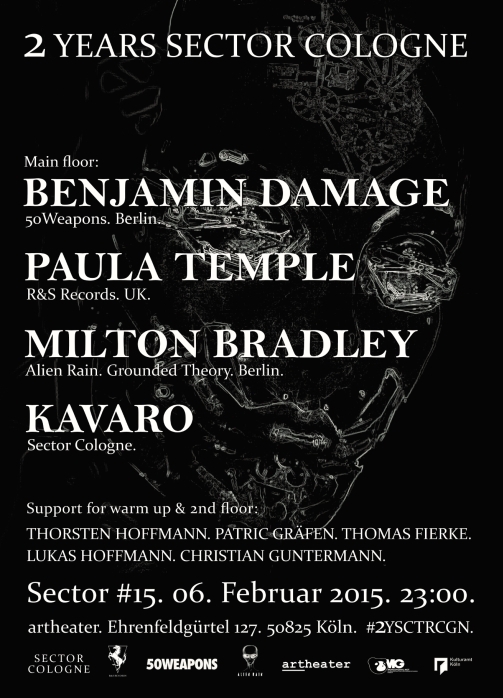 At Feb. 6th 2015 we celebrate 2 Years Sector Cologne at Artheater Köln. For the anniversary we invited three known artists of the Techno scene for the big stage of the club: Benjamin Damage from Berlin’s well known imprint 50Weapons, Paula Temple from UK and known for her smashing releases at the legendary R&S Records/Belgium and finally Milton Bradley from Grounded Theory Berlin. He was our first guest at Sector #1 in 2013 and is known for his own record labels Do Not Resist The Beat!, End Of All Existence, his actual project Alien Rain and his cooperation K209 with Henning Baer. They will get full support from Thorsten Hoffmann (Transition Aachen) and Sector resident Kavaro. At the 2nd floor of the Artheater will play the Cologne based DJ’s Patric Gräfen, Thomas Fierke, Lukas Hoffmann and Christian Guntermann. Copyright © 2019 Sector Cologne.